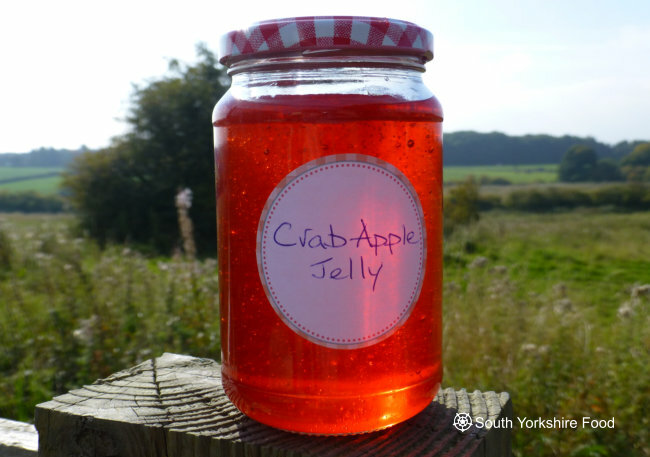 Crab apples are very sour tasting, but they make fantastic jelly! The fruit are usually small and red, between 1cm-4cm in size with wild crab apples being bigger. I made this jelly from a miniature tree grown in a tub on my patio and the fruit were about 1.5cm. It yielded just over 1kg of fruit, which was more than I expected - this is a young tree so maybe I'll get more next year. The fruit made enough jelly to fill two and a half 1lb/380ml jam jars. you will also need two or three warm sterilised jam jars, a jelly bag, a cold saucer in the fridge, and a jam/sugar thermometer, and a jam funnel if you have them. Wash the fruit, and discard any that are badly damaged or rotten. No need to remove the stalks. Cut each apple in half and put them in a large sauce pan or jam pan. Add enough water to just cover them; if they float, you have too much water. 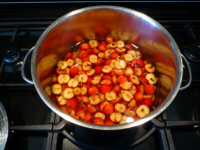 Bring them to a boil, and simmer them for about 30 minutes or so, until the fruit is soft and starting to break up. When they get to the soft stage, I usually help them along with a potato masher, to make sure that they are nicely mushed! Leave the fruit to cool a bit, and place the jelly bag in a large bowl, and ladle the fruit mush into the bag. Hang the bag over the bowl and leave overnight to let the juice drip into the bowl. You can help this along by squeezing the bag ( I did), but this sometimes makes the jelly cloudy as you can get fruit particles coming through the bag - it still tastes OK, though. Now weigh the juice - I got 750g. You have to match this with the same weight of sugar. Put the sugar in a large sauce pan or jam pan, over a low heat, and slowly heat the sugar until it is melted and dissolved by the heat, but don't let it get too hot as it can spit when you pour in the juice. Now carefully pour in the apple and lemon juice, mix well with the sugar, and whilst stirring, bring slowly to a rolling boil. You will need to keep this at a rolling boil for about 30 minutes, but keep stirring regularly, to make sure it does not catch on the bottom of the pan and burn. Skim off any scum and discard. The mixture will slowly thicken, and after 30 minutes you need to test for set. If you have a thermometer, test the temperature; 105°C is the jam setting point, or put a teaspoonful onto the chilled saucer from the fridge, if the edges wrinkle slightly when tipped, the jam is ready. Turn off the heat and let the jelly cool a little, then carefully ladle the hot jelly into the warm sterilised jars. Use a funnel if you have one, as it easy to scald yourself with the hot jelly. Seal the jars and leave to cool. Enjoy! Tip: To sterilise jars, either place them in an oven preheated to 150°C /300°F for 10 minutes, or put them through a hot cycle in your dishwasher.